Posted in: gaming, geocachers, geocaching, hobbies. 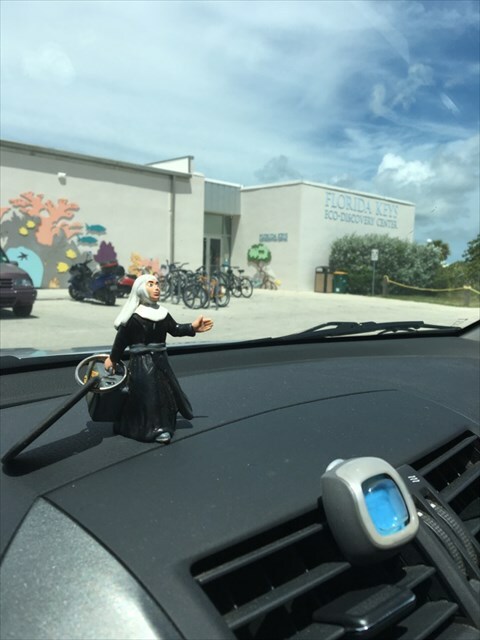 Tagged: Florida, geocachers, geocaching, nun, trackables. Finally my geocaching trackable has come back onto the radar after an almost 12 month hiatus. Sister O’Brother , aka Roamin’ Catholic, was picked up by a geocacher named Eskil while in Scotland and subsequently taken to Germany. There was an 11 and a half month wait before she resurfaced on the trackable map. Not only did Eskil fail to register this trackables movements, they also appeared to have boycotted reading her mission to reach the Vatican. Now in the capable hands of U.S. geocacher TheLF (who provided the photo above), she is enjoying a little Florida sunshine before they move her along. She has at least been clearly looked after, but how she ended up there is a mystery. Welcome back online Sister! Posted in: Uncategorized. 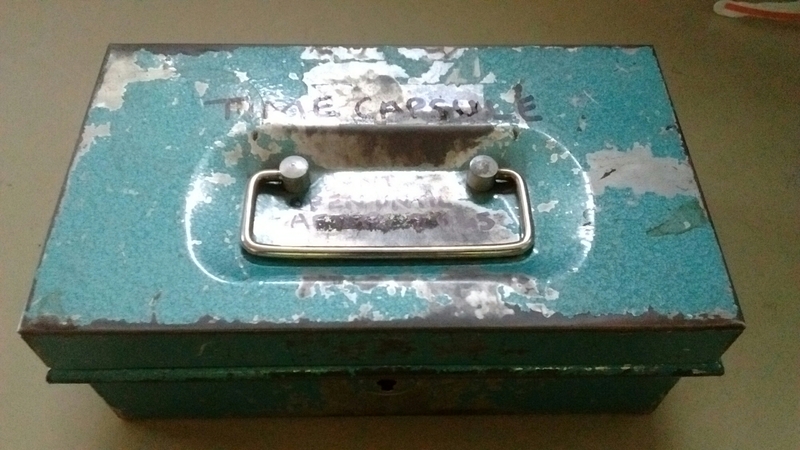 Tagged: geocaching, time capsule. I enjoy geocaching but I compiled and hid my first ever time capsule today. It’s been hidden within the fabrication of a building so with any luck won’t be discovered unless severe renovation work is carried out in the area. Written upon it twice is the request it isn’t open until 2045. I should be long gone by then, at least in the retirement sense. It’s only a small tin box about the size of them petty cash boxes you can get. Posted in: Uncategorized. Tagged: caches, geocaching, metal detecting, time capsule, time capsules. Posted in: Uncategorized. Tagged: a-ha, adrenalize, def leppard, geocache, geocaching, hunting high and low, pink Floyd, the wall, trackable, travel bug. You know travel bugs? Those little trackable thing you put into geocaches? Well I own three of them. Ones in the hands of someone who isn’t active anymore, ones in a decommissioned cache in the Pennines and another has been lost due to a pillock. It’s within my wit to get it going again but these things cost money. If you’re not gonna move them on why take them? Posted in: Uncategorized. Tagged: Boris Johnson, David Cameron, EU referendum, geocaches, geocaching, munzee, Nigel Farage, Virtual Munzee. So Regina is back from leave. In theory thing should get marginally better at work. Then again , maybe not. But I’ll not be letting my areas suffer. It’s my Sponge I feel sorry for at her new job. I think it may be a bit gruelling as it seems to be quite an intense job with no margins for error. At least it will only be for a fortnight and will pay some way for her. I feel so helpless, but I’m always there. Hopefully that’s something better than nothing. I’ve deployed two new geocaches and a virtual munzee over the weekend. Of course, Tentmantent was the first to find the one in North Hykeham. Wtg! Got rid of the one I made that’s been sitting in my pocket all week. That’s close by, so I’m beginning to dominate my residence area. I’d like to do another munzee trail. Will see how many I have got left and think of a theme. Gathering ideas already! So Boris Johnson has claimed he wishes to vote out of the EU. His reasons are perfectly correct as well. Nigel Farage is pleased but naturally David Cameron is bricking it!